This summer Legendary® shines a giant spotlight on the mutants of the Marvel Comics world. The X-Men have held a special place in fan’s hearts for generations and the one mutant that has risen above the others, that is mentioned before any other, is Wolverine. Even from the core set of Legendary®, Wolverine has had a place within the game and shows his face more than any other character due to his various personifications throughout comic history. But can you have an X-Men centric expansion without the Canadian berserker? We think not. While Wolverine does have a playable character card set in Legendary®: X-Men, for the first time he will share his set with another; his teammate Colossus. Divided Cards return from Legendary: Civil War, with two miniature cards printed on the same card. If a Divided Card costs “3” on each side, you only pay 3 to recruit it from the HQ, not 6. When you play a Divided Card, you choose which side to play. You generate all of the Attack, Recruit, and special abilities of that side as normal. You ignore the other side, as if it doesn’t exist. 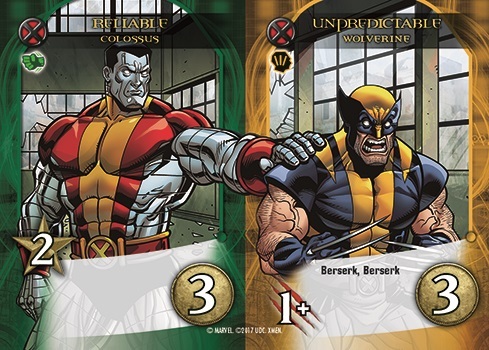 Colossus’ level head versus Wolverine’s unpredictable rage can make this card adaptable to any situation. 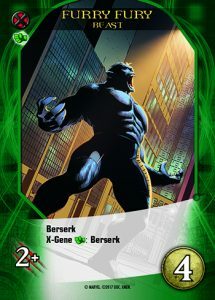 Wolverine’s Unpredictable side does reveal a new Keyword to Legendary® – Berserk. Berserk represents some X-Men going into a berserker rage of unpredictable violence. Cards with Berserk cause players to discard the top card of their deck. If the discarded card has an Attack symbol on it you get additional Attack equal to the printed amount on the discarded card. Some cards, like the one above, say Berserk multiple times. This means players will discard a card for each printed Berserk. They will gain Attack for the combined total of the cards discarded. Berserk gives no benefit from discarding non Attack cards. 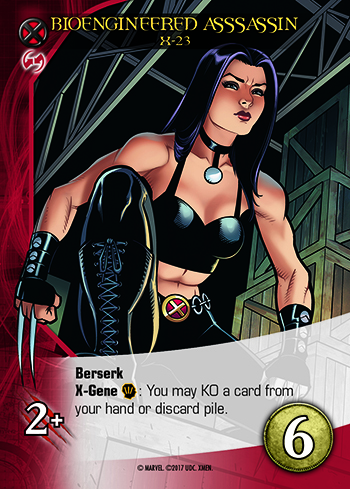 Discarding cards from a player’s deck might be seen as problematic except for another Keyword within Legendary®: X-Men. X-Gene is all about the X-Men combining unique mutant powers with their signature teamwork. 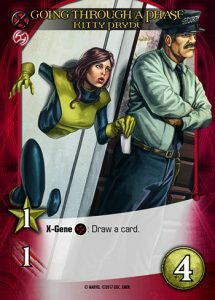 X-Gene looks for a specific type of card in a player’s discard pile. 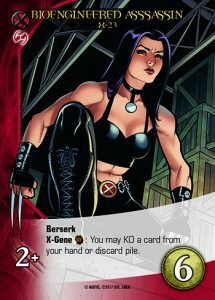 Kitty Pride’s card above is looking for an X-Men team affiliated card in that player’s discard pile. If there is one, that player can draw a card. An X-Gene card’s ability can only be used once, no matter how many matching cards are in the discard pile. At this point we would like to go over the timing of when a card is discarded. When you play a card during your turn, it stays in front of you until the end of the turn. Then all the cards you played that turn go into the discard pile. If you have an empty discard pile, X-Gene abilities will not trigger, but if you recruit a card (that card is immediately placed the discard pile) it may be able to trigger X-Gene effects in later played cards. Some X-Men are known for their rage, but also their teamwork and can have both Keywords. When played, these keywords must be completed in order. We hope you’ve enjoyed today’s preview of Legendary®: X-Men. Tune in next week when we reveal a new currency for Legendary®. If get more psyched about this I might just go super saiyan. If you berserk, The top card of your deck is discarded and this is in the discard pile for the x-gene check on the same card, correct?